Richard Heller recently wrote an article highlighting the inconsistencies in the sentencing of food safety and hygiene offences. 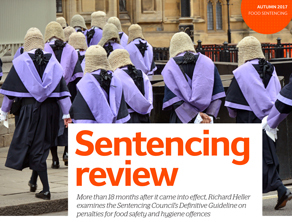 Some eighteen months since the Sentencing Council’s definitive guideline on penalties for food safety offences, Richard examines the impact the guidelines have made and explains the nine step process the sentencing tribunal must follow. To read the article in full, click on the thumbnail image below.